You have got to give this game a try. Be sure you have a camera close by when you play. Materials: All you need is a paper bag (grocery size). The best place to get them is at your local grocery store. Ask for paper the next time you are checking out. This game is great for the whole family. You will get better at it the more you play. To Play: Have your family stand in a circle, stand the bag upright and place it in the middle of the circle. One at a time - each person puts their hands behind their back and balances on one leg. 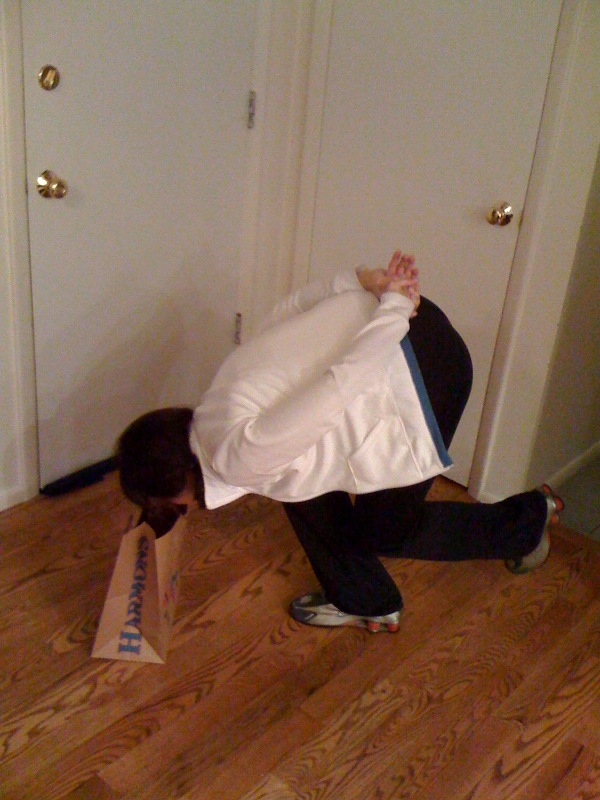 They then bend over and try to pick up the bag with their teeth (still on one leg, hands behind their back). Once they pick up the bag the next person gets a turn. Once everyone in the group has taken a turn, rip or cut a layer off the bag making it slightly shorter all the way around. You can take as much or as little as you want. Once you have made the bag shorter, everyone takes another turn trying to pick up the bag with their teeth at the new height. Continue taking turns, and then cutting layers to make the bag shorter and shorter. As people are unable to pick up the bag they are eliminated. Keep playing until the last person can still grab the bag with their teeth. For smaller children that will find balancing hard, no need to make them balance on one foot. It is hilarious to watch your family as they try to bend lower and lower to pick up the bag. Perfect for Monday night, or any night. I love the games you have posted! They are so fun and creative! Thank you! Thanks Heather for posting, I always look forward to your cute ideas and advice! You post really great FHE/game night games. It really takes the stress out of figuring out an activity. Thanks! we tried this last night and the 2 year old loved it. one extra note: at the end i had a few rings of the paper bag (from the trimming) and i told the 2 year old that they were his prize and he wore his proudly around the house afterward! Nice Post Keep it up..